The dance floor starts to take shape. There's even a Pro-Shop with lots of clothing and accessories. Soffe shorts - cotton, mesh, slicks, and teeny tinys, plus sports bras, racerbacks, dance pants, jerseys, sports tape, make-up, and more. 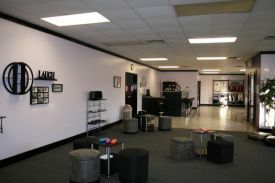 Our front lobby area is large and spacious. 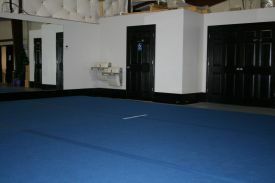 We have 2 competition size practice floors, a spring floor for Allstar Cheerleaders and a foam floor for High School and College cheerleaders. 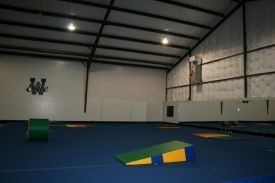 We have the only 40' inground trampoline and 18' X 16' foam pit around. 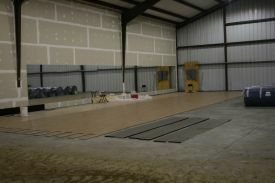 There is a 42' spring strip going into the pit and the foam floor also leads into it. 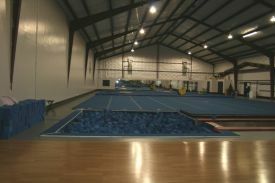 So no matter which type floor you practice on, you have access to the pit. 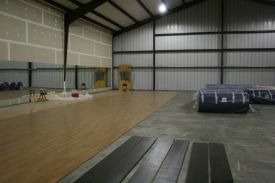 There are practice mats and mirrors to assist you in your training. 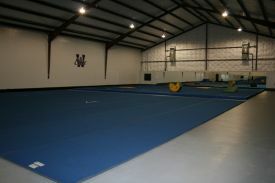 We even have water fountains and a restroom in the gym for your convenience. The pit seems to be everyone's favorite. And it is great for learning new skills. 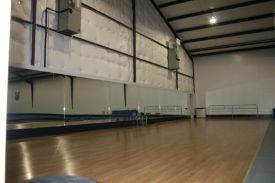 We have a full size dance studio with mirrors and ballet bars. So whether it's Hip-Hop, Ballet, Tap, Jazz, Modern or Lyrical that you're interested it, this is the place you'll want to be.